The last date for linking Aadhaar with PAN has been extended to 30th September 2019 from 31st March 2019. However, it is mandatory to link your Aadhaar with PAN for filing ITR. Timely payment of taxes not only gets you immense benefits in terms of savings but also keeps you out of troubles like penalization, bad credit score due to non-compliance, etc. 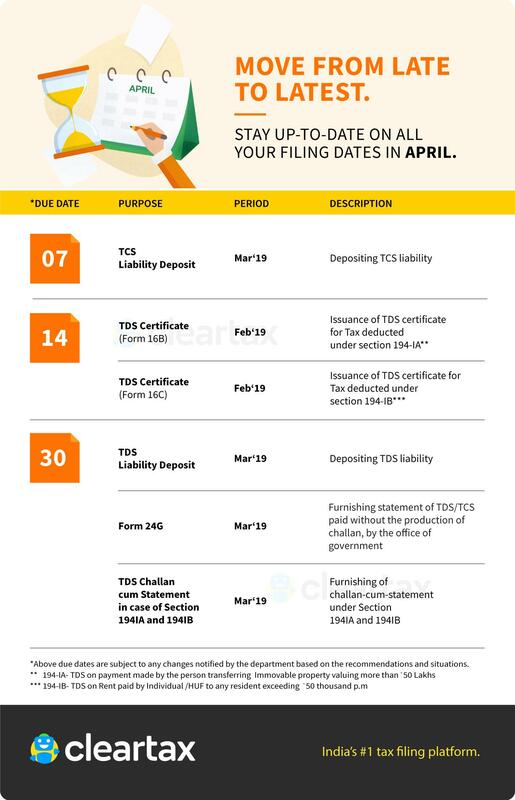 Here is a month wise tax calendar for the year 2019-20 to ensure that you do not forget these important dates under Income Tax. *Above due dates are subject to any changes notified by the department based on recommendations and situations. *** 194-IB- TDS on Rent paid by Individual /HUF to any resident exceeding fifty thousand rupees p.m.
*** 194-IB- TDS on Rent paid by an individual /HUF to any resident, exceeding Rs. 50,000 p.m.